If there is one thing about SAKs that are open for impressive areas then it is modifications. There are plenty of people that can do the most incredible and innovative things with them. If you experience a broken blade on a knife then it is fully possible to re-profile the remains of the blade into a new design. The tip part is the science and how this is done sometimes need a professional sharpener with equipment for it. I touch this subject again because this can be done on Wenger or Victorinox knives or any other for that matter. 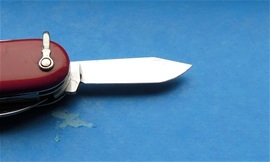 You can bring new life to a knife without sending it for repair and it is possible to do yourself. It is fun and gives further knowledge on knives. If you experience bent functions then it depends on how much it is out of shape and you should not bend it back. If it just a small thing then just let it be. If it much out of place and you must bend for it to close into the body then it is a different matter. No matter what it will weaken the steel to some degree. It depends on how hard you will use it. If you experience a broken phillips/pozi screwdriver then it is difficult to re-profile it to a new phillips/pozi because it usually will never be as strong and it must/may be smaller. I am careful saying it cannot be done because I have been surprised so many times on what people can do. It is also possible to make a new or different function on it. It will not come and haunt you if you experiment. The same problem may happen on the flat screwdrivers and the steel will not become the same. This is probably because of the tempering and steel process. Let me know! It would need someone with knowledge on it. If you experience the functionality is not there because of damage or other problems then it should be sent for repair. When a blade has been broken and repaired it is always a re-profiling even if one make the same shape. On the picture to the right you see a clip point blade on an older Victorinox that i repaired because the tip was broken. Tried to make it similar to the original. It is not rare that you can find knives with broken blades. This is usually always from abuse.